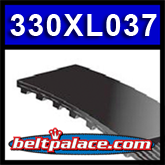 330XL037 Timing Belt: 165 Teeth, 3/8" Wide, 1/5" (.200/XL) Pitch. 33" Length. Replaces 330XL037 binding machine Belt for GBC DigiCoil automatic coil inserter part 1730544.